where dark green countries represent the most hits and white countries represent no hits. The two darkest countries are the United States and the United Kingdom by a long a way, which doesn't particularly surprise me. 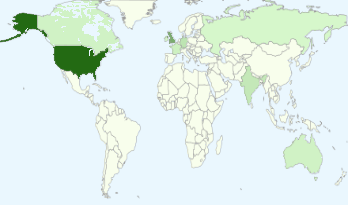 The next band of interest seems to be from western Europe, Canada, Russia, India and Australia. I think this represents the nationalities of most of the people I've met and that of authors of papers I've read fairly well. I know that colouring countries isn't an ideal representation of interest over a geographical area, but I didn't want this to turn into an exercise in statistics.